Be Forward Wanderers new catch, Francis Mkonda, has said linking up with his former Masters Security compatriot Babatunde Adepoju will offer their new club more attacking options. Mkonda joined Babatunde at Wanderers this week from the Carlsberg Cup champions after being linked with several big teams in the country. He became the Nomads’ third signing in the current transfer window after Tigers hitman Peter Kasonga. Mkonda and Babatunde were key players in the Masters squad that sent shock waves across the country’s football landscape after beating crowd pullers Nyasa Big Bullets and Wanderers. Mkonda said he is excited to have reconnected with Babatunde after helping Masters to Carlsberg Cup glory and a fourth place finish in the TNM Super League. The 2018 Midfielder of the Season said he enjoyed his partnership with the Nigerian and believes their pairing will thrive at Lali Lubani Road. “We combined very well with Babatunde at Masters and I believe we will do the same for Wanderers once given the chance. Our combination worked at Masters and there is no way it can flop at Wanderers. “We can only appeal for patience from Wanderers supporters as we may take time to settle down since we are new at the club. But we will eventually make them happy once we acclimatise to our new environment,” Mkonda said. He said playing for a big club has been his long cherished childhood dream and thanked Masters owner Alfred Gangata for facilitating the move. “It was possible for Masters to frustrate the move but Mr Gangata was very understanding and allowed me to pursue my career at Wanderers. We talked about it amicably and reached an agreement,” Mkonda said. 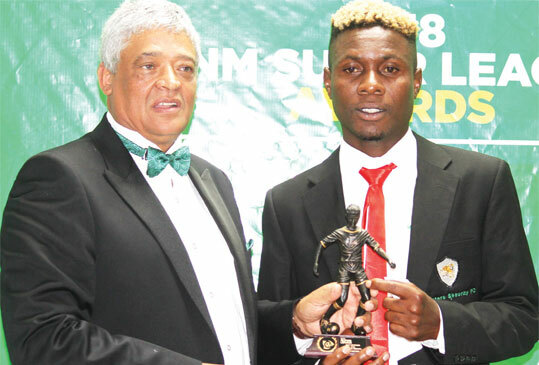 Gangata said Mkonda was his team’s captain and will be missed at the Lilongwe-based side. “We have killed our team by letting Mkonda go. But we had to do it because Wanderers met our conditions. There was a chance of the player going to other big clubs but Wanderers were quick to reach an agreement with us and we are happy with what has happened,” he said. Gangata said he is currently working on replacing Babatunde and Mkonda ahead of the new season which officially kicks off on March 30 with the Chifundo Charity Shield at Kamuzu Stadium in Blantyre.